Now is the time to apply pre-emergent and winterize your lawns. We provide a variety of products to help with this including Fertilome and Hi-Yield products. If you are looking for pre-emergents try Fertilome All Seasons 16-0-8. 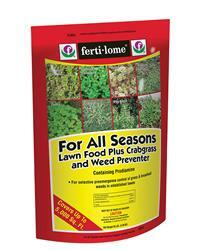 Apply in early spring or fall 2 to 3 weeks prior to seed germination to obtain control of grassy and broadleaf weeds. Controls Henbit, Oxalis, Poa Annua, Chickweed, Crabgrass, Foxtail, Purslane, Shepherd’s Purse, Prostrate Spurge, Knotweed and others listed on label. For best results, application should be followed by 1/2 inch of rainfall or irrigation. This entry was posted on Thursday, September 12th, 2013 at 8:58 pm	and is filed under News & Updates. You can follow any responses to this entry through the RSS 2.0 feed. Both comments and pings are currently closed.